The role of the United States during the Cold War is one often marked by tragedy, repression and the support for authoritarian regimes throughout the western hemisphere. That perception is shared throughout Latin America, which makes one wonder if there are cases in which U.S. foreign policy actually helped Latin Americans in their quest for socio-economic development and democratization during this turbulent period. Aragorn Storm Miller invites us to rethink US-Latin American relations by exploring the unusual case of Venezuela during the 1960s. 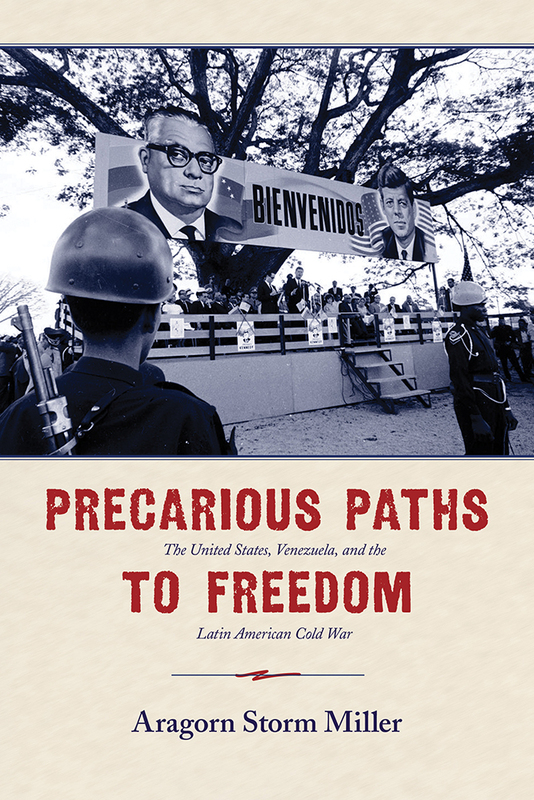 In Precarious Paths to Freedom, he examines the economic and military partnership between these two countries that proved to be essential to achieving the twin goals of economic development and democratization while fending off political extremism. As many other places in Latin America at the end of the 1950s, Venezuela emerged from ten years (1948-1958) of military dictatorship looking to democratize and modernize. Soon, however, the Cuban revolution offered an alternative path to socio-economic development in the region. The rivalry between the United States and Cuba would threaten the stability of the hemisphere. To navigate these turbulent waters, politicians in Venezuela had to strike the right balance between appeasing popular demands and suppressing political extremism to preserve democracy and achieve economic prosperity. 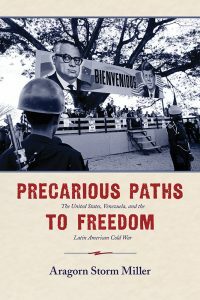 Miller shows how the administrations of Rómulo Betancourt (1959-1964) and Raúl Leoni (1964-1969) deftly courted American policymakers for economic resources while severing diplomatic ties with Latin American autocracies regardless of their ideology. The Betancourt Doctrine, as it became known, stood as a norm of Venezuelan diplomacy during the 1960s despite the constant support that the United States provided for military dictatorships elsewhere in the hemisphere. By studying these diplomatic episodes, Miller also underlines the fact that U.S. power was not absolute, and that Latin American agency weighed heavily in shaping the histories of the region. Throughout the book the author analyzes how this joint effort in democratization and modernization connected local developments to the broader ideological clashes between Cuba and the United States, and between these two and China and the Soviet Union globally. In the struggle for political peace, Venezuela became the target of internal and external extremism testing the resolve of moderate politicians and the centrist government coalition. Likewise, the American-Venezuelan partnership went through several trials from radicals on both sides of the political spectrum that threatened to derail the prospects for democratic governance. First came right-wing reactionaries who carried out several failed attempts to unseat Rómulo Betancourt between 1958 and 1960. The most shocking of these plans was spearheaded by a traditional ally of the U.S., the dictator Rafael Leónidas Trujillo (1930-1961) of the Dominican Republic. who financed a mission to kill Betancourt. The plan consisted in detonating a bomb near the passing presidential motorcade that killed the driver but only wounded the Venezuelan president. After this episode, the demise of the extreme right was succeeded by leftist insurgencies from 1962 to 1969. The Venezuelan Communist Party and the Movement of the Revolutionary Left first tried to achieve power in alliance with disaffected leftist officers in the army with whom they engineered two failed military uprisings (El Carupanazo and el Porteñazo both in 1962). The next phase of the insurgency involved guerrilla warfare with significant support from external communist allies. The discovery of crates full of Cuban weapons at the Paraguaná Peninsula in 1963, and the successive landings of Venezuelan guerrillas with some Cuban troops and instructors in Tucacas (1966) and Machurucuto (1967), are only some of the episodes that the author addresses in order to show how Venezuela became the prime target for Cuba’s hemispheric plans during this decade. Miller devotes approximately two thirds of the book exploring the genesis of the guerrilla movement, the divisions that plagued it early on, its financial connections with Cuba and the Italian Communist Party, its lack of popularity among ordinary people, and its failure to achieve power through violent means. However, the Venezuelan government perpetually struggled to eliminate this threat from the urban and rural areas of the country. Through a two-prong strategy that involved beefing up the Venezuelan military in counterinsurgency methods and national civic actions, coupled with the issuing of presidential pardons of imprisoned insurgents to reintegrate them to mainstream politics, the administration of Raúl Leoni dealt the final blow to the guerrillas. In this shared effort to preserve democracy the United States’ contribution in military aid became crucial. Its funding is what allowed the Venezuelan government to create multiple ranger battalions that were decisive in the final offensives against the guerrilla in 1967 and 1968. By 1969, the second peaceful transfer of power from one civilian government to another (and the first in the country’s history from a governing party to the opposition ) seemed to mark the triumph of moderate forces over extremism and the consolidation of democracy in Venezuela. Miller concludes by pointing to three factors that made possible this extraordinary political outcome. The special rapport that existed between the American and Venezuelan presidents during this period assured a sound footing for diplomatic cooperation and economic and military aid. On the other hand, The Puntofijo Pact, a formal arrangement signed in 1958 between the mainstream political parties in Venezuela (AD, COPEI and URD), enshrined the commitment of the political elite to preserve democracy at all costs. Finally, the deep-seated popular beliefs in a democratic regime led the Venezuelan people to constantly support the system through massive participation in electoral politics. Using a concise and enjoyable writing style, Miller reminds us that despite the appalling record of authoritarian violence in the hemisphere, American foreign policy also showed some bright spots through the successful democratization of a Latin American country during the Cold War.